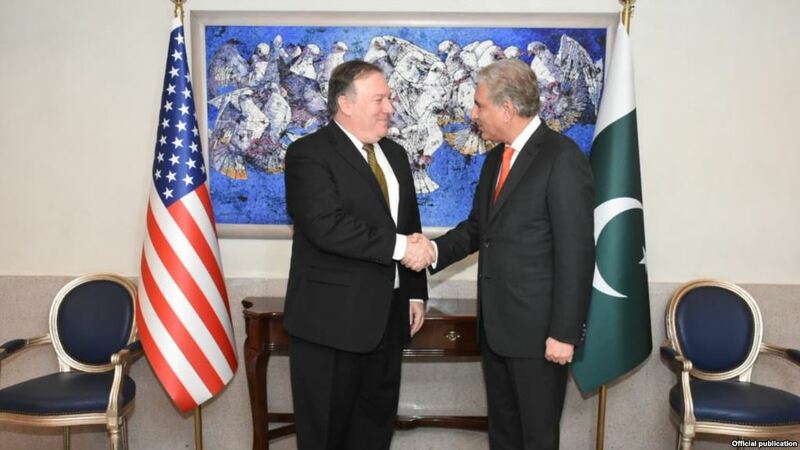 Islamabad - The US Secretary of State Mike Pompeo has arrived in Pakistan where he will meet Pakistan's Foreign Minister Shah Mahmood Qureshi on the issue of Afghanistan's Peace Process and action against Extremists/Militants by Pakistan Authorities. After discussion, Pakistan's foreign ministry spokesman said in a brief statement issued on Twitter that the delegation of two countries discussed bilateral, regional and international issues. 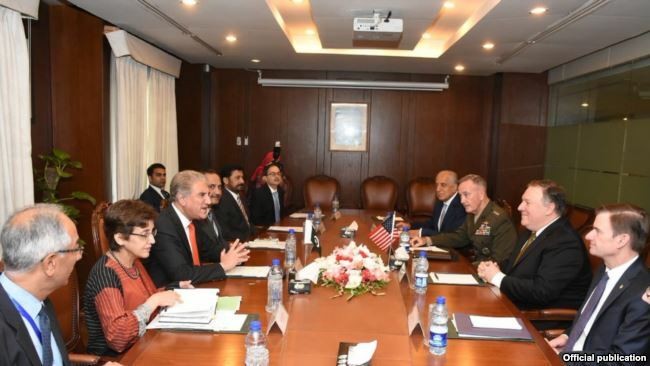 Talking to the US Secretary of State, Mr. Shah Mehmood Qureshi, emphasizing the need for mutual ties to give a new dimension based on respect and trust, said that Pakistan's first priority will be its national interest. Joseph Dunford, head of the US military force, along with US Secretary of State Mike Pompeo, has also arrived in Pakistan on Sept. 05, 2018. The US delegation includes a former US ambassador Zalmay Khalilzad, the US State Department announced Tuesday to set up its special representative for Afghanistan. Khalilzad has already been the US ambassador to Afghanistan, Iraq and the United Nations. This visit of US State Secretary is being held at the time when the United States government has canceled the financial assistance given to Pakistan, which is due to high tensions between both two countries. In a statement before the arrival in Pakistan, Mike Pompeo had said that Pakistan has not yet taken many actions against terrorist groups that don't want the United States victory in Afghanistan. Mike Pompeo said, 'The Pakistanis should need to know Why the US Support coalition fund has been suspended just because we are not satisfied with the performance of Pakistan against the war on terror.' The United States administration accuses Pakistan of supporting Haqqani Group and Afghan Taliban that are mainly fighting with US forces in Afghanistan. On the other hand, Pakistan strongly rejected the accusations of the United States said that "The U.S. Administration after continuously beaten up the Afghan Taliban is now targetting Pakistan. Sometimes, U.S. Administration says, Russia is funding Afghan Taliban and sometimes they say, Iran is involved in arming Afghan Taliban. Even in the presence of United States Military, How is ISIL being recruited, trained and armed in Afghanistan."